I hope the new year has been good to you thus far, I can’t believe we are already 1 1/2 months into 2010. Did you make any diet related resolutions this year? Are you still sticking to your resolutions? If so, good for you. You may want to bookmark this recipe for when you a) break your resolutions or b) if you need something to eat on your “free” day. Please don’t run away –this soup isn’t diet food but it is an absolutely delicious creamy soup that is comforting on a frigid night. My brother-in-law (who works in a restaurant kitchen) probably loves food as much as I do. He made me this soup for lunch a couple weeks ago. It was wonderful. He boiled the potatoes in chicken stock, and once they were tender he added rest of his ingredients. Brilliant! I can’t believe I never thought about boiling cubed potatoes in chicken stock and using that starchy boiled stock in the soup. This is truly a one pot meal. You can make a lot or a little in a short amount of time. This soup is great for those “it is so cold to do anything” type of days, and this winter we have had plenty of those. In a large pot add potatoes, onion, garlic, and bay leaf. 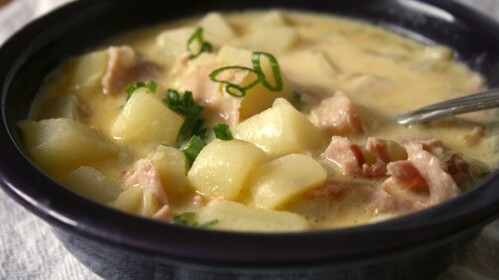 Bring to boil and simmer until potatoes are fork tender, about 15-20 minutes. Add ham, cream, milk, and cheese. Stirring until cheese is melted. Jamie! Love your site, everything looks delicious, can’t wait to try some of your recipes! BTW, I featured you on Friday at my little corner of the web! This looks delicious and I want to make this in the next day or two. How many servings is this recipe? I’ll be feeding 8 adults. Laura this would serve 4-6 portions. I hope you enjoy the soup! Thank you for the quick reply! Looks like it is on the menu for Friday, just in time for more wintery weather headed our way. Cheers! Finally getting back here to let you know how the soup turned out. In a word: Wonderful! Thank you for sharing – this recipe is definitely a keeper!